The Paris Hotel in Las Vegas has a little Potemkin village wrapped around the casino gaming floor, with quaint old European cafes, shops, and restaurants. They also put in cobblestone streets and painted a reasonably convincing cloudy blue sky on the ceiling. 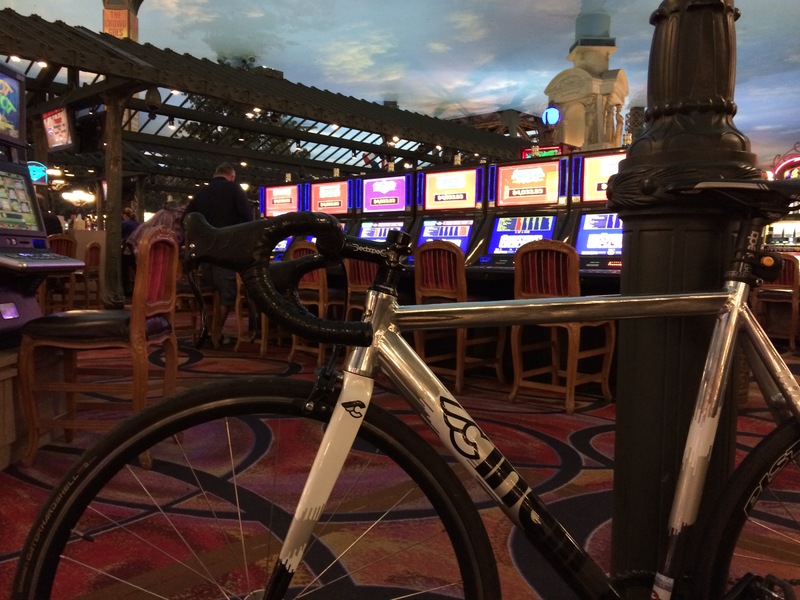 So when I finished my 90 km fixie ride up to Red Rock and back, I rode into the casino and ate a petit sandwich with a Perrier at Le Cafe, in my sweaty t-shirt and jeans. The street scene was so authentic, that the only bicycle in a Vegas casino looked about right. Anyways, I managed to eat lots of bread, fruits, and vegetables, with little meat or fat. There wasn’t any bakery in Paris, but I bought a big bag of Rold Gold pretzels from the sundry shop near the elevators. My weigh-in this morning was good, and I lost about a kilo over the last two weeks.